Love, love, love this quilt! Perfect colors, great quality, and so, so comfortable. Exactly as pictured. Great size and quality fabric. Would certainly buy again. Enhance your bedroom with the timeless elegance and comfort of this Tommy Bahama Tidewater Jacobean quilt set. Crafted from soft, machine washable cotton, the set includes a gorgeous comforter and matching shams, decorated with a delicate floral pattern over a sea glass blue and grey background. The quilt reverses to a diamond basket weave that complements the sumptuous quilted pattern of the beautiful set. First of all, this is a beautiful quilt and appeared to be well made. I did not notice any strange smells when I opened the package and it covered my 18" thick queen mattress just fine. At least long enough to meet the dust ruffle on each side. Unfortunately, I returned this since it was not the exact blue I was looking for. It is a very bright turquoise/aqua blue - more like a Caribbean Blue. The reverse side is a white & grey diagonal pattern and didn't seem to compliment to Jacobean pattern on the front. My other dissapointment with this quilt is it is extremely thin. Was hoping for a quilt with a little more heft. Perfect colour &amp; thickness for a beachy look in Arizona. I ordered two king quilts for our two queen beds. These quilts really shrink! After one wash on cold &amp; hanging to dry on my indoor quilt rack they have shrunk a lot. They now fit like a full size quilt on our queen beds. 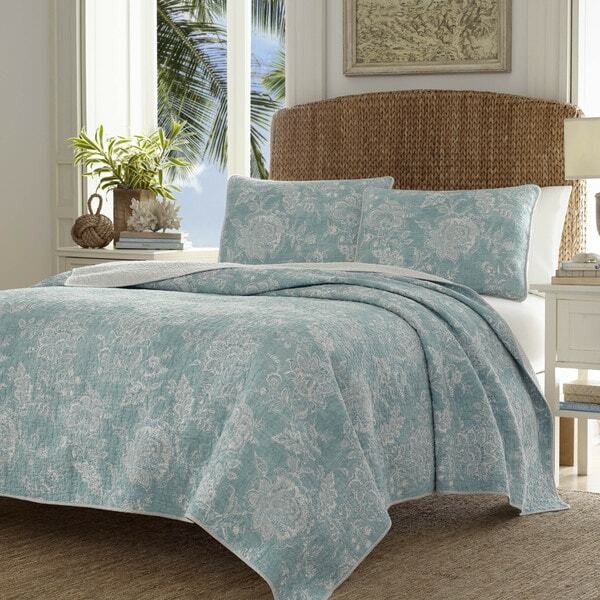 The quilt set is beautiful &amp; is an aqua color that looks like the picture. I ordered the king size for a queen bed because we have a very high bed that needs the extra length on the sides. It fits like I wanted, but will have to have a bedskirt (which I wanted) only because of the height of the bed .The color has the beach type look.. Shipping was so fast I was shocked when it arrived so early. Thank you Overstock for the free &amp; fast shipping, great products. I have never been disappointed. Beautiful quilt set, high quality and perfect color. It's even prettier than the picture with an aqua/blue color. The design is perfectly centered on the shams and along the edges of the quilt. It looks much more expensive than it cost. I love it! The look was okay, but the fabric was flimsy and would not stand up for multiple washes, and it felt like it contained very little cotton. Okay for a guest room, but not for regular use. This aqua color is beautiful and goes with my room nicely. I have a 2inch foam topper on my pillow top king, so the quilt barely covers the edges of the mattress, but that's okay for my setup. This set is very nice the color is BEAUTIFUL and great Tommy Bahama quality, the shams are large and tie in the back, the stitching is perfect and it is very well made. This is a wonderful comforter set. Because it's real cotton, it feels wonderful. And the combination of antique white and turquoise allows for a wonderful selection of decor pillows you can find online to do a very pretty pillow display. It's also the perfect weight, not too light, not too heavy, and warm enough that you may find you do not need a second blanket even in winter, but light enough in summer to let your body breathe while you sleep. Very pretty love the look and feel. I was disappointed but I kept it anyway. I’m wishing I would have sent it back but for some reason I didn’t. The picture looks like such a soft sky blue and the actual quilt looks like it has a lot of texture and fullness to it. This isn’t the case. It’s very green blue turquoise and it’s really a lot flatter and smoother than I’d hoped. It just looks heavenly in the photo but it’s not. Don’t waste you money. I think I might run it though the wash with some bleach and see what happens. I don’t have much to lose now. I am happy with the color and quality. It is very thin though. I thought it would be a little thicker. But I am still happy with it. Perfect for my coastal theme bedroom. Love the color!!! Adds the needed punch of color. This is a durable yet pretty quilt I bought for my vacation home. It looks pretty and has not faded after washing. I have gotten many compliments on this purchase and will definitely be a repeat buyer for this brand. Just as pictured. Subtle blue fits perfectly in our guest bedroom. it good quality. the color and very good and vibrant. it feels amazing on your skin and it's very durable. It was deliver on time and package well. Sorry but I loved the bedspread it self but it cam down about 6 or 7 inches on each side of my king size bed. I can pull it down on one side since the other doesnt show as much. Would have been perfect if it had been wider. Still love the weight and quality. Hate the size. The set is made very well but isn’t as shown in the photo. It doesn’t hang over the edges of the bed as far down as show. I wonder why makers of these products don’t show the actual size when it’s on the bed. Anyway, the color is nice, the spread is well made, it’s held up under a wash. I just wish it fit the bed as shown in the photo rather than barely reaching the bottom of the mattress. Was a beautiful set but the color was off so I returned it. Love this quilt, beautiful soft sea green. Have washed it weekly and comes out better than new. "does it have a cotton batting or polyester?" Quilt is 100Percent Cotton, pre-washed for added softness. "Can you please advise the measurement of the Tommy Bahamas queen and king breadspreads. Also what is the delivery cost to NSW Audtralia"
I like the color and the fact it is cotton and thinner than most comforters. "Is the color blue green? My room is a blue green color, not teal and not blue. Was hoping this might coordinate with my room."